The amount of new woodland created in England last year amounts to under 700 hectares, an area little bigger than London's Olympic Park. This falls far short of yearly targets needed to plant 11 million trees by 2020 and raise woodland cover from 10 to 12% by 2060, say MPs. Improving grant schemes for forestry is key to creating more woodland, their parliamentary report found. And it said safeguards were needed to stop ancient forests disappearing. MPs from the Environment, Food and Rural Affairs Committee (Efra) have published a report, Forestry in England: Seeing the Wood for the Trees, calling for the government to take action to increase woodland creation. 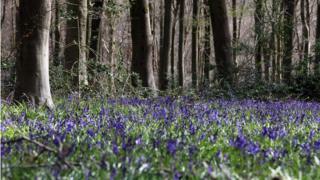 Giving evidence, The Forestry Commission said there was a need to "speed up" woodland creation, while the Royal Forestry Society called for a "step change" in the rate of planting. Efra committee chair, Neil Parish MP, said administering the forestry Countryside Stewardship Scheme was "not fit for purpose". Under the scheme, farmers and other landowners receive funding to improve woodland. However, three agencies are involved in administering the scheme, and witnesses described the process as "tortuous", "bureaucratic" and "overly complex". The government should instead "reintroduce a one-stop shop for forestry grants", said Mr Parish. And he said the government must use the Article 50 negotiating period to provide the sector with reassurance that it is championing its needs in discussions on big policy issues such as Brexit, the industrial strategy and house building. "Forestry must not be forgotten in a future British Agricultural Policy," said Mr Parish. Greater use of UK timber rather than imports, including incorporating a UK-timber-first approach into English housing procurement policy. Clarifying protections for ancient woodland in the planning system, given concern over the rate at which ancient woodland appears to be disappearing. Setting up a public register and inventory of ancient woodland. Ensuring that the UK's exit from the European Union does not act as a barrier to tackling diseases that affect trees. The Woodland Trust has campaigned on many of the issues covered in the report. Chief executive, Beccy Speight, said it clearly highlighted the barriers to progress that forestry in England faces. Forestry and wood trade body, Confor, said The Forestry Commission should be given responsibility to "reverse a tree planting crisis which threatens to plunge England into deforestation". It said given current "woeful" planting rates, the government target of planting 11 million trees by 2020 will not be hit until summer 2027. Confor chief executive Stuart Goodall said Scotland had a much more straightforward system and could hit its target of 10,000 hectares of new woodland every year in 2017. "England must embrace a system which allows tree planting to happen, to deliver wide-ranging economic, environmental and social benefits - creating rural jobs and investment, reducing the impact of climate change and flooding, and delivering beautiful modern forest habitats to support wildlife and recreation," he said. The Welsh government has made a pledge to plant a tree for every child born or adopted in Wales, plus an additional tree in Uganda for every child.